Hanan Ben-Ari, a rising star in the Israeli music scene and the nephew of former MK Dr. Michael Ben-Ari, has dropped a hot new single that is as uplifting in its message as it is invigorating with its mizrahi beat, to precede his imminent debut album "Izun" (Balance). 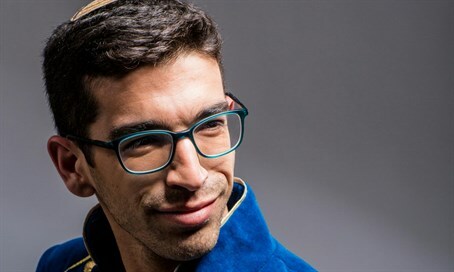 Ben-Ari has shot to fame and gained wide support with two previous songs that received heavy rotation on the radio and became instant hits: his debut single "Mimecha Ad Elay" (From You to Myself) and "Mother," a soulful ballad on the expulsion from Gush Katif. The promising singer has already successfully recruited well over 100,000 shekels on the Headstart crowd-funding site for his upcoming album, and broke the records on the site for the funding of an Israeli album. His new single "Hachaim Shelanu Tutim," which literally means "Our Lives are Strawberries" and indicates the sweetness of life despite the at times overwhelming hardships, takes his Jewish groove and soul sound in a new direction with a mizrahi rhythm, and includes sign-language accompaniment so that all can enjoy the upbeat message. The new song details various hardships in life, noting on "corruption every two weeks, terror attacks every two days." "It's hard to get our pay to last the month, hard to adhere to holiness; entire lives without roots, there's no Arak and there's dryness; the battery is used up, the roof leaks; the state steals, and the government? It's cross-eyed," sings Ben-Ari. He then breaks into the rousing chorus: "we don't have any right to complain; everything is tfu, hamsa and Baruch Hashem (Blessed is God); our lives are strawberries!" After pointing out the hardships, Ben-Ari breaks into a session of gratitude, saying among other things: "thanks for my soul, that I don't have time to rest; thanks for the Shabbat, for two sons and a daughter."